more clients than you can handle! GET CLIENTS NOW! is a complete sales and marketing system used by thousands of business owners, consultants and other professionals worldwide since 1995. It’s a training program and coaching program combined. We offer 3 options for learning and implementing the Get Clients Now! Program. Scroll down to complete the form to be notified about all upcoming Get Clients Now! Events and Programs. Make it easy on yourself. The book is used as a textbook and a reference throughout the program. Be sure to purchase the PAPERBACK version of the book, as each of our programs refers to the paperback version only. You may buy a Kindle version but it is much harder to use as a reference. 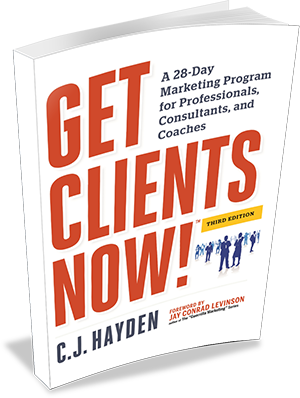 Click Here to order your paperback copy of Get Clients Now!